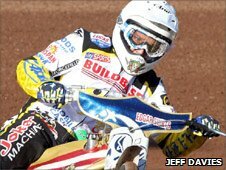 Coventry Bees have been forced to postpone Friday's Elite League meeting at home to King's Lynn Stars due to rider shortages. The decision has been made because four of Coventry's top five are involved in Grand Prix qualifiers over the weekend. Captain Eddie Kennett, Ryan Fisher and Kenni Larsen are in Denmark on Friday while Przemyslaw Pawlicki rides in the Czech Republic on Saturday. No new date for the meeting has yet been announced.